Norm MacPherson is a Victoria (British Columbia, Canada) Music Hall of Fame Inductee 2010, with a Lifetime Achievement Award, and is well known for recording and touring with multiple bands (interestingly he is also an active bassoon player with the Sooke Philharmonic Orchestra, Victoria Chamber Orchestra, and The Victoria Civic Orchestra). He is also guitarist in The Gardening Club, the band put together by singer/guitarist/artist Martin Springett, and co-produced their last album, ‘The Riddle’. Martin keeps sending me videos of Norm recording in the studio, and he has a wonderful delicate approach to electric guitar. As Norm says, “After 55 years of playing guitar in blues, rock, and country bands and 55 years of playing in symphony orchestras, I thought it was time to put the two together. These are some of my favourite classical pieces arranged for guitars as well as a couple of my own creations. 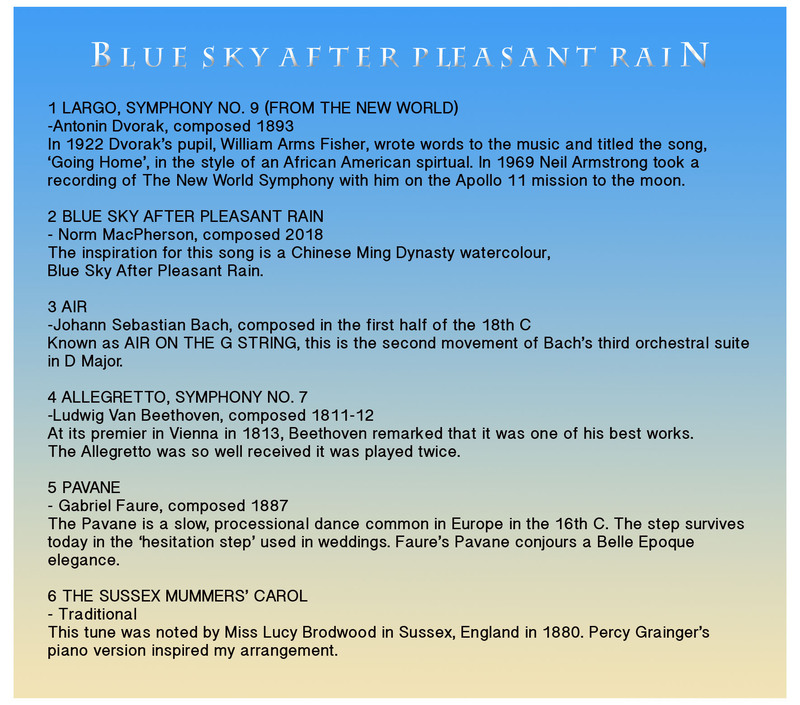 And I did include the bassoon.” Released as a digipak, with wonderful artwork of course from Martin throughout, this is an album which is delight to listen to. Norm has a high clear sound on guitar, and his love and knowledge of different forms of music allows him to combine the styles in a way that stay true to the originals yet also add additional insights. I am not 100% convinced that the percussion always works, but there are times when he is providing slide as on “Adagietto” when it all makes perfect sense. He can be reflective, and while he can be forceful when the mood is right, this album is emotional and passionate in a way that shredders who produce millions of notes to the bar can never imagine. 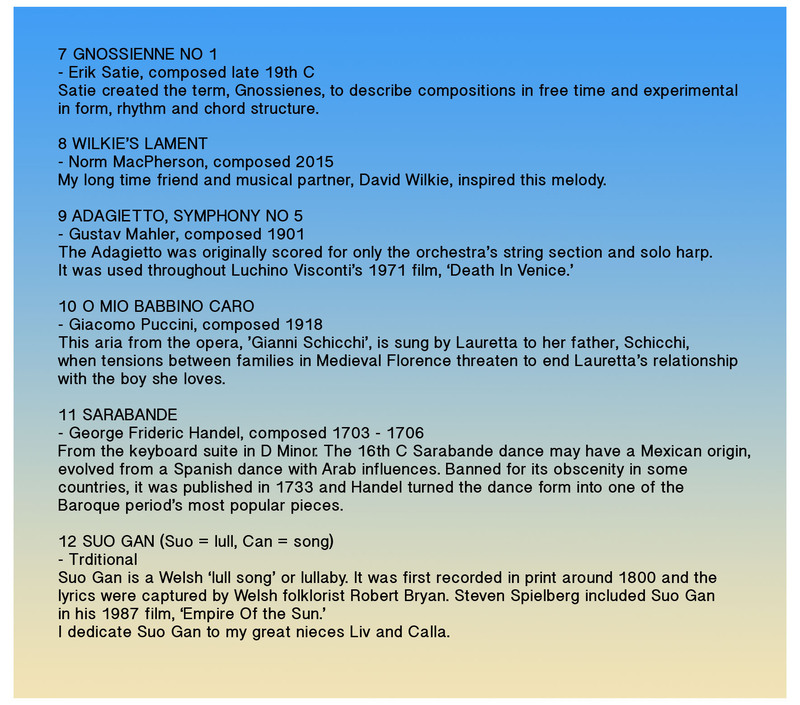 In the digipak there is a little history of each song, although I had to smile when I heard his “Ari”, a version of Bach’s “Air On The G String” which to those of us of a certain age raised in the UK will always think of as the Hamlet advert. Here it has been treated with reverence and respect and if Gary Brooker had been known as a guitarist instead of a keyboard player he would have been delighted with this. 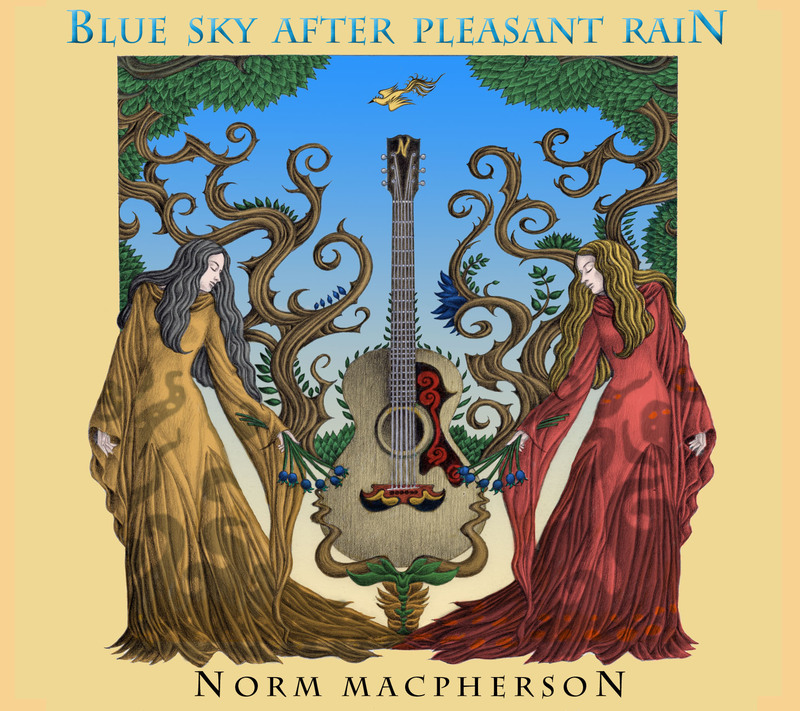 To listen to samples (and buy the album of course) then visit http://normmacpherson.com – it really is a delight.